There was no Powerball winner last night. So smart saving and investing may be your best shot at getting rich right now. 1. Global market overview: Stock markets are moving in a positive direction on Thursday after two days of significant losses. 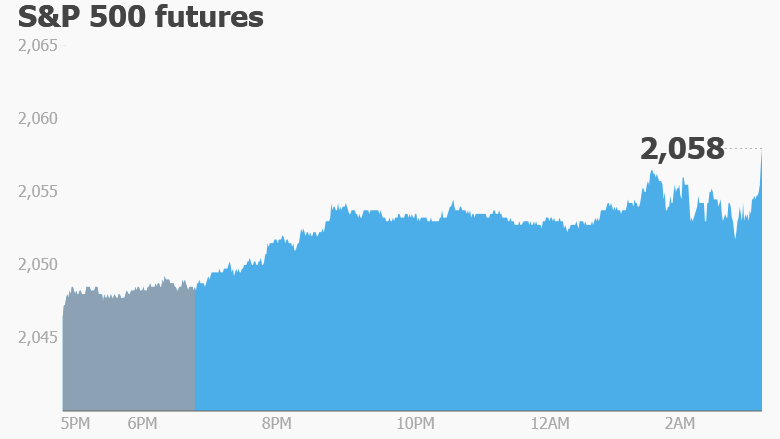 U.S. stock futures are pointing up and European markets are rising in early trading. Chinese markets ended with gains, while Japan was closed for a holiday. In the commodities market, oil prices are rising by about 3% to trade above $45 per barrel. Precious metal prices are also strengthening. The global bond market is mixed, with yields on 10-year U.S. government bonds edging up. Related: Is China fueling a new commodities bubble? 2. Tesla motoring ahead? : Shares in Tesla (TSLA) could see higher-than-normal trading volume on Thursday after the company released its latest quarterly results. The electric automaker posted a net loss of $282 million but reaffirmed plans to put 80,000 to 90,000 new electric cars on the road this year. Tesla's stock has struggled in 2016, down more than 7% since January. Shares were flat after-hours when the company issued its report. 3. Earnings: There are a ton of earnings coming through on Thursday. Alibaba (BABA), Kellogg (K), Merck (MRK), AMC Networks (AMCX), MGM Resorts (MGM), Time (TIME), SeaWorld Entertainment (SEAS) and Chesapeake Energy (CHK) are all reporting quarterly results before the opening bell. Then Activision Blizzard (ATVI), DreamWorks Animation (DWA), Yelp (YELP), Square (SQ) and Herbalife (HLF) are among the key companies reporting after the close. 4. Ones to watch -- Takata, Tribune Publishing: Japanese auto parts company Takata is recalling an additional 35 to 40 million airbags due to the explosion risk they pose to drivers and passengers. This move more than doubles the size of what was already the largest recall in history. Japanese stock markets have been closed for a holiday but will reopen Friday. In the newspaper world, Tribune Publishing (TPUB) has rejected Gannett's (GCI) $815 million takeover offer, arguing that it "understates the company's true value." The owner of The Los Angeles Times and The Chicago Tribune said Wednesday that Gannett's proposal "is not in the best interests of its shareholders." Gannett, which owns USA Today and nearly 100 local newspapers, made the unsolicited $815 million offer in late April. 5. Turkish lira recovers: The Turkish lira took a sharp drop on Wednesday on concerns that Turkey's prime minister is about to be ousted due to disagreements with President Recep Tayyip Erdogan. The currency is recovering some lost ground on Thursday but the main stock index is down 1.5%.